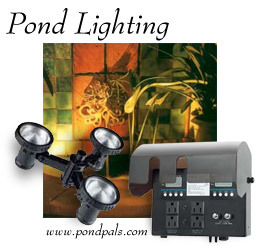 Lighting for Ponds, Water Gardens, Fountains, Statuary, Waterfalls, Landscaping projects and more . . .
A garden pond in the evening is even more beautiful with appropriate pond lighting. Soft lamps, a glittering water surface and fountains bathed in color can create a spectacular ambience your family and friends will admire. Hemphill's Garden and Aquatic Center offers a wide range of products to add night time beauty to your pond. So "Light it up" and enjoy your pond at night! To purchase pond lights, foggers, solar lights, and transformers for your pond, water gardens, fountains, statuary, and other landscaping projects, select a manufacturer from the menu above. We carry lighting and accessories such as foggers, power centers, and transformers from top manufacturers such as AquaGlow, Aquascape, Alpine, Atlantic, Beckett, Cal Pumps, Laguna, Little Giant, Pondmaster, Savio and more. The pond lights for that manufacturer will be shown, along with the prices. If you aren't sure which pond lights would be right for you, stop by our store or give us a call. We would be happy to assist you in making a selection.